Cempra received a complete response letter (CRL) as a X-mas present from FDA, and the news was pretty bad for company investors. Bad, but not totally unexpected after the AMDAC meeting last November, which taught us a few new things about the drug. It also highlighted how strategic missteps can get you into trouble in drug development. RULE #1: Don’t shoot yourself in the foot! Why the company had to study NASH and COPD before being on the market as an antibiotic is just plain incomprehensible. Yes, we know about all the wonderful things that macrolides can do besides being antibiotics, but was there a reason to start high-exposure, long-term trials with solithromycin before obtaining approval for the regular-dose, regular-duration indication? FDA reviewers pounced on and dissected those 6 NASH and 4 COPD cases finding ample confirmation for hepatotoxicity. 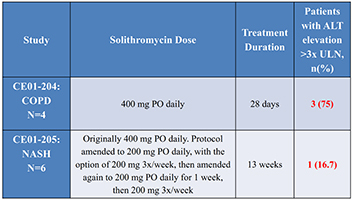 Cempra was aware of it: in an attempt at damage control, the solithromycin dose had been reduced repeatedly (see Fig. 2) because of issues with liver toxicity. RULE #2: Make it easy on the reviewers to like your drug! We heard repeatedly that solithromycin was unlike telithromycin, despite being almost indistinguishable in molecular structure. Now it would have been nice to see direct comparison data demonstrating that solithromycin is really a new kind of ketolide. With little chance to show better efficacy, the task was to demonstrate a different and more favorable safety or tolerability profile. Unfortunately, that case was not made convincingly. The DILIsym analysis presented by Dr. Watkins should have been the center piece of the argumentation but it hardly mentioned telithromycin. It appears his team did not have access to the data which the Regulators had in their files (FDA mentioned that a collaboration with DILIsym is now underway). Whatever the results of this joint modeling exercise, they will come too late for Cempra. The argument was won by team FDA that showed how Ketek was simply a cleaner ketolide compared to solithromycin at a comparable development stage. Man, that really hurt! So by omission and commission, some critically important pieces were not provided by the Cempra team, which could have helped; rather some extraneous data from an unnecessary foray into hepatology/immunology were supplied that hurt. Call it another teaching case for strategic drug developers of anti-infectives! In its CRL, FDA requested a new safety study of 9,000 solithromycin patients, preferably in CABP. This seems to be quite feasible: Sanofi was able to execute a 24,000 patient safety study for Ketek in 5 months, paying approx. USD 400 per patient and setting a new standard for low quality and study oversight in the process . Now, some 15 years later, per patient costs will be a bit higher and the study will probably take a bit longer. The real costs here are opportunity costs by coming to the market significantly later. This entry was posted in QIDP Antibiotics, The News, The Viewpoint and tagged AMDAC, antibiotic blog, Aventis, CABP, Cempra, complete response letter, CRL, DILIsym, FDA, Harald Reinhart, hepatotoxicity, Ketek, ketolide, LFT, liver toxicity, NASH, non-alcoholic steatohepatitis, Sanofi, Solithera, solithromycin, telithromycin, tolerability by Harald. Bookmark the permalink. Next → Next post: Is the AOM Indication Making a Come-Back?